I grew up in a military family and joined the Air Force in 1971 during the Vietnam War. 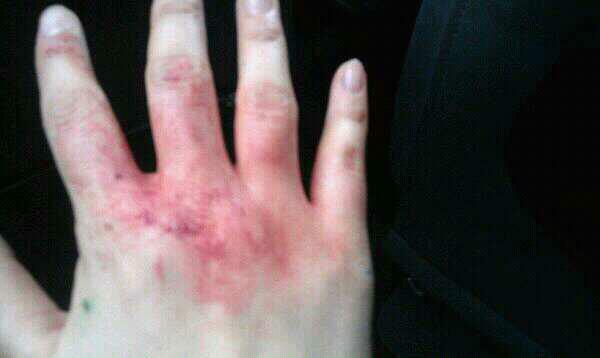 It was there that I became a peace activist. Watch Bruce's Cable TV Show: "This Issue"
I am in Stamford, CT waiting to speak in a workshop at the national anti-war conference that has drawn several hundred people from thoughout the country - primarily from the east coast. Two bus loads of Muslim activists just pulled up outside the hotel where the conference is being held. There are quite a number of people of color here - many Asians, folks from Middle East and Latin America - all victims of the U.S. -NATO expanding war on people who live near resources that the corporations want. There has been alot of talk at the conference about the national protests that will be held in Chicago in mid-May when NATO holds its summit in Obama's home town. I am doing two workshops today. 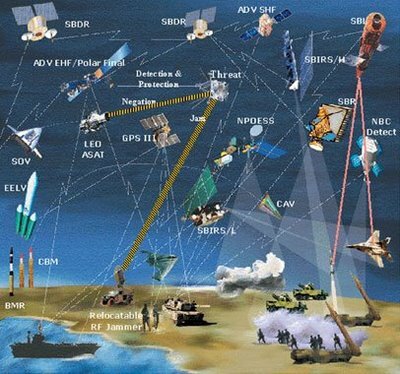 In the first one I will talk about how Obama's expansion of "missile defense" deployments surrounding Russia and China are leading to a new arms race. In the second workshop I will facilitate a discussion about the Bring Our War $$ Home campaign that got its start in Maine but has now spread all over the nation. We are all being brought onto the reservation now. Those who think we still live in a democracy are fooling themselves. Those who think there are real differences between Republicans and Democrats on these issues are wrong. The current election campaign is a distraction - the power elite wants you to focus on and worry about Romney or Obama while they are putting us in a technological cage and throwing away the keys. Wake up, look around, think it through, and come alive. Our real enemies are the corrupt corporate oligarchy that controls our natural resources, the banks, the media, the military (and local police forces), the courts, and our "elected officials". What they don't have control over is our will and our energies. We need to use them to organize a determined and sustained opposition against their dominance. On April 17, 2012, thousands from around the world will take part in the second annual Global Day of Action on Military Spending. With actions taking place in more than 30 countries, we will send a message to the 1% who profit off war and destruction, and the governments who do their bidding. Global military spending reached over $1.6 trillion in 2010, and on April 17th, the Stockholm International Peace Research Institute (SIPRI) will release the data for 2011. Almost certainly, they'll announce that military spending went up. As the people of the world face existential crises from climate change, conflict and underdevelopment, the resources we need to solve humanity's problems are being overwhelmingly devoted to death and destruction. In 2011 people spoke in one voice for a global priorities shift. This year, we'll raise our voice even louder. I had a nice long chat with Benji Monnet this morning who is back in France after being deported from Gangjeong village and South Korea. His tired and sore body is recovering from 10 months of intense solidarity work with the villagers and from the very rough treatment by the South Korean police. He told me he feels like a tree pulled up from the ground. I asked him to consider organizing a speaking tour around Europe on the Jeju Island issue and said I'd help him make contact with people there. It would be a huge help to bring this issue to an important part of the world. I am going to participate in two workshops at the United National Antiwar Coalition (UNAC) national conference this weekend in Stamford, Connecticut. Then when I get back I have to go full out to get ready for my west coast speaking tour which will begin in San Diego on April 2. I've got my first draft of my basic talk outlined and just need to refine it. Much to do though to get ready. High school student Morgana Warner Evans singing yesterday at our rally inside the state capital in Augusta, Maine. A surprise guest showed up - tea party Gov. Paul LePage (in the blue shirt). And it's legal in the U.S. The U.S. and Britain always seem to lead the pack in despicable practices. Doesn't the Bible have something to say about usury? If you lend money to any of my people with you who is poor, you shall not be like a moneylender to him, and you shall not exact interest from him. But love your enemies, and do good, and lend, expecting nothing in return, and your reward will be great, and you will be sons of the Most High, for he is kind to the ungrateful and the evil. The Catholics in South Korea are like none other I've ever seen. They put the flesh on the bones. The cut to the chase. They jump in where others fear to tread. They are real Christians. I wish it were the case here in the U.S. and in other parts of the world. 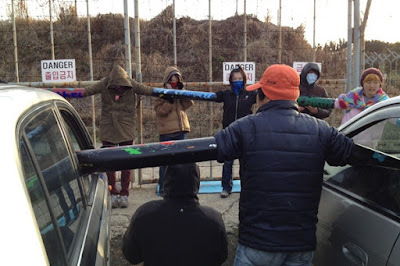 Lately I've been trying to help widen the circle of activists in the U.S. who are working on the Jeju Island Navy base issue. Getting Veterans For Peace involved has been a great gift to the movement. Now my goal is to get Pax Christi in the U.S. to take a more active role and I've been appealing to every good Catholic activist friend I know to help make that happen. Thanks to several of them around the country things are beginning to stir. They will quickly discover that their movement in the U.S. will become strengthened by working more closely with their extraordinary peers in South Korea. Yesterday in Seoul Catholic priests held a mass in front of one of the Samsung offices. 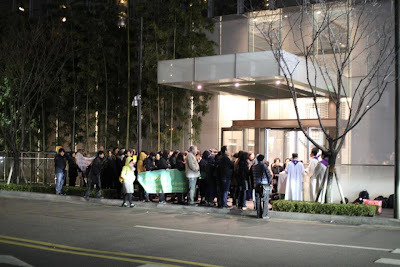 The priests and lay people are escalating their pressure on Samsung and from reports we are hearing from inside South Korea this is starting to have an impact. The right-wing newspapers that support President Lee are increasingly printing articles and Op-eds that support and justify the Navy base construction. For the longest time the Gangjeong village struggle was ignored by the national press in South Korea. That is all changing now. Samsung and President Lee are getting desperate. That's why they blocked the three VFP members from going to Jeju. "Samsung, the image of Cain who stains Korean peninsula with the blood of Abel. . ." Path of cross (prayer and meditation walking through the 14 stations of cross during the lent) will be held at exit No. 7 of Gangnam subway station at 7 p.m. toward Samsung. . . It takes about 30 minutes. . and Catholic mass at Samsung at 8 p.m."
My respect for the South Korean Catholic community continues to grow. 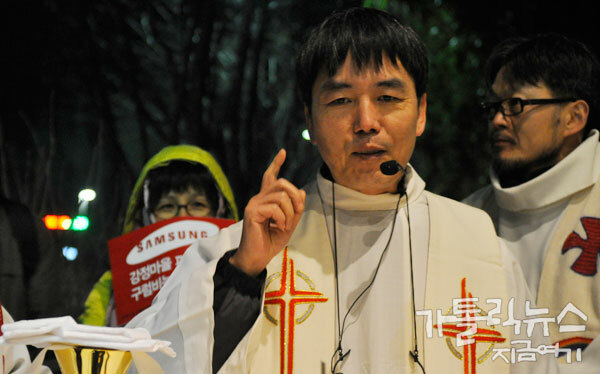 Professor Yang Yoon-Mo was released on bail in the evening of March 20 from Jeju prison. It was 42nd day of his hunger strike. About 20 Gangjeong people including Gangjeong Mayor Kang and Fr. Moon embraced him with broad smile. "Protecting Gureombi rock is my faith. . . hunger strike will be continued" said Prof. Yang. Paco Booyah also reports, "We had a quite a crowd on Gureombi and managed to occupy it from early morning until after dark! Of course, we had the usual very annoying struggles with the police in the port. There are some new police from Busan who don't seem to really know what is going on here. Anyway no blasting today so of course that makes it a good day!" During an afternoon rally inside the Hall of Flags in Augusta, Maine today (March 20), a high school student from West Bath publicly scolded a red-faced Gov. Paul LePage and other lawmakers. The rally, organized by the Maine Campaign to Bring Our War $$ Home and Occupy Maine, was briefly interrupted when Gov. LePage entered the Hall of Flags. The more than 100 people in attendance began chanting “Shame, Shame, Shame” at LePage’s continued attacks on working people and social progress in Maine. At first the governor went into his office, but a moment later came out with his entourage and stood alongside the rally, clearly wanting to see who the group was that was chanting at him. At one point the governor appeared to stick his tongue out at the crowd. After listening to several speakers LePage finally left when retired DOT worker Loren Snow (Ellsworth) gave a heart-rending account of life under a state pension that is increasingly under attack by the current administration. Snow’s meager $1,500 a month pension is being eaten up by having to pay larger shares of health care costs, without cost of living allowances, as he tries to care for an ill wife and disabled adult child. Video of the rally (including LePage’s presence) can be obtained from Regis Tremblay at 207-400-4362. Photos were taken by Peter Woodruff who can be reached at 207-798-2979. 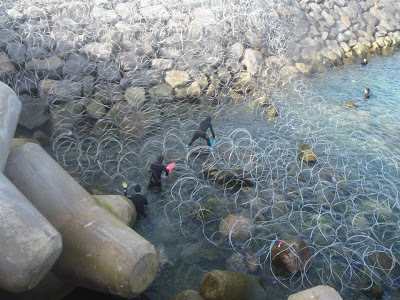 The South Korean Navy and Samsung brought the hammer down hard on the young people who non-violently attempted to block the moving of explosives that would be used to blast Gureombi. You don't have to understand Korean to know that these kids were hurting but their courage shines through. Every minute they delay the destruction of Gangjeong village they allow the rest of us around the world to catch up and build support. Let's remember the bottom line here - save the environment from the world's worst polluter (the military) - save a 450 year old fishing and farming culture from being torn apart - stop the building of a Navy base that will be a spark for U.S. and Chinese military confrontation in the Asia-Pacific. This fight belongs to all of us. It's a global issue and needs a global response. We can all do something to help save Jeju.....start by boycotting Samsung. The U.S. is like Hollywood. Democracy, freedom, liberty all sound good on the silver screen but when you try to put these concepts into real life practice the rubber meets the road. America is illusion. It's like false advertising done by mega-corporations. Nice image but poor product. Many Americans like to swallow the "freedom" bait because it makes them feel better and it is easier to justify doing nothing to change things. They convince themselves that our nation is superior to the rest of the world. American exceptionalism they call it. But it's all a lie. Anyone who exposes these illusions is bound to suffer as America has the power to make you pay for pulling the veil off the rotting corpse. But it must be done. The story must be told. The lies must be exposed. The hypocrisy must be challenged. The "friendly fascism" must be confronted. There is nothing exceptional about America. It's just another bad movie. Human shields with arms thru pipes early this morning to block the transportation of the explosives in front of its storage place. . . Gureombi is alive. . . Don't kill Gureombi. Stop the blasting of Gureombi. 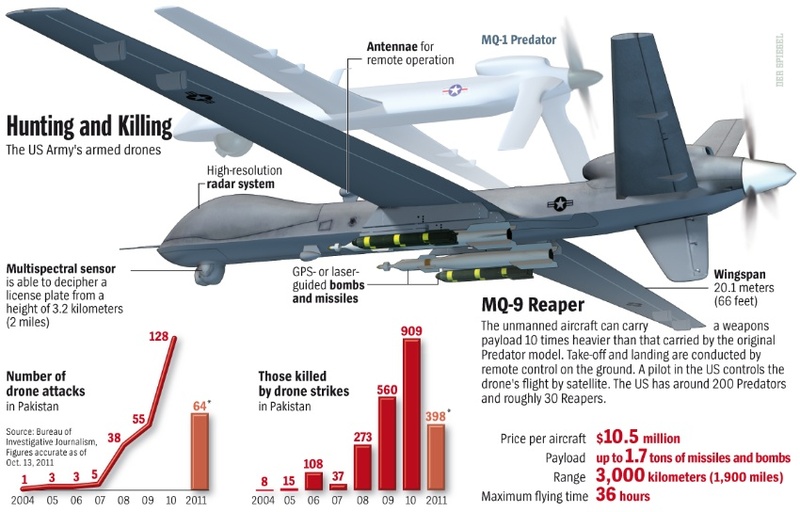 Are Obama's Efforts to Justify Drone Warfare Aimed at Iran? 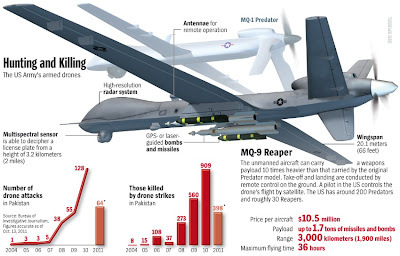 When it comes to America's security, President Barack Obama has turned out to be just as ruthlessly determined as his predecessor -- particularly when it comes to using drones to wage the war on terror. But the target of his recent legal repositioning might have much less to do with terrorists than with Iran. My sister Laura drove over from Orlando yesterday to meet with me and cousins Bob and Kathy at the ballpark. (She took this photo but none of us are in it.) Tonight will be the 4th game I've seen since I got here and I return home tomorrow. It has been very hot in Florida. 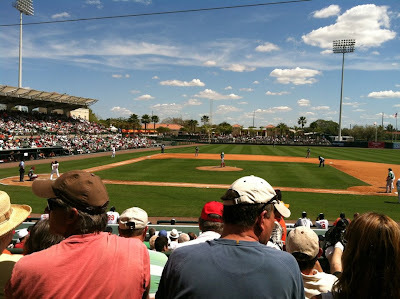 At the start of each game they announce the temp (85 degrees yesterday) and they also give the temp of the opponents home city. Yesterday it was 47 in Boston. 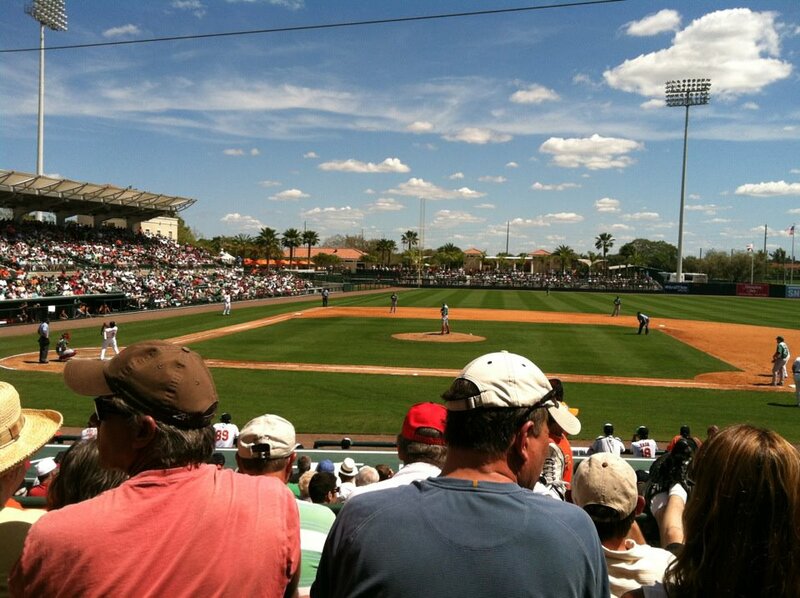 Everyone smugly cheered about the heat in Sarasota. I groaned. I'll take the 47 any day. After 10 years in Maine I am clearly not adjusted to this hot box. My talk the other night at the Unitarian Church in Bradenton was well received by most. There were a couple Democratic Party loyalists who didn't take kindly to my critiques of their president and their party. Let's just say it got a bit energetic and interesting during the Q & A. I told my hosts that if George W. Bush was still president the "critics" would have all loved my talk and cheered my attacks on him. But with Obama in power the liberals just can't cotton to such bi-partisan accountability. One of the women at the talk just called and asked me to come back next year - she said if I would agree she'd get started working on it now. That's planning ahead! A DC Resident, 24-Year-Old Joel Northam, gave RT permission to meet up with him periodically for nearly six months. He discovered the Occupy Movement in DC is much like society itself with a variety of people and ideas. Still he remains committed to changing the system. As hundreds of people joyously celebrated the six month birthday of Occupy Wall Street in Zuccotti Park (New York) on Saturday night, the largest gathering in months without police barricades, the NYPD declared the park closed at 11:30 pm. They moved into the park swinging batons, beating people attempting to exercise rights that are supposed to be legally guaranteed. The New York Times reported that scores were arrested. The NYPD has no constraints. They think they can do this with impunity. “One thing is clear already: if this illegitimate wave of repression is allowed to stand… if the powers-that-be succeed in suppressing or marginalizing this new movement… if people are once again 'penned in' — both literally and symbolically — things will be much worse. THIS SUPPRESSION MUST BE MASSIVELY OPPOSED, AND DEFEATED. “On the other hand, this too is true: movements grow, and can only grow, by answering repression with even greater and more powerful mobilization."